Jeremiah Johnshon (1972) screens today at the Autry Museum. Its icy vision of the solitary frontiersman draws on McCabe and Mrs. Miller (1971) and anticipates the warmer dynamic of Pat Garret and Billy the Kid (1973). 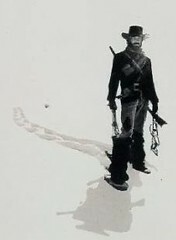 Young Jeremiah Johnson heads into the Rocky Mountains in search of genuine experience and beaver pelts. He embraces physical struggle—wherein is release from his pain. He takes a wife, adopts a child, then loses everything, eventually gaining something much greater. In the end his enemies come to regard him as one already dead, or who never will be.